At the time of King William's Domesday records, 1086, there is no mention of the town of Cromer. Instead, we read of Shipden, a town that now lies beneath the sea. In medieval times we read of Cromer, alias Shipden. The town centred on two becks which fall into the sea, the east beck which joins the sea at the natural break known as the Gangway, and the west beck, which nowadays is piped underground, joins the sea close to the pier. Fishermen and merchants plied their trade from the beach below, and sheep farmers keeping their flocks on the hills behind the town. 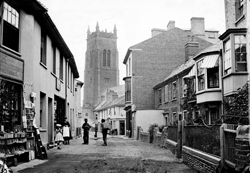 In 1285 the king granted Cromer a Friday market and a yearly fair of eight days. The church of St Peter and St Paul replaced the two earlier churches, that of St Paul (which was a smaller church on the site of the present one) and that of St Peter (which was already close to the receding cliff edge when the building of the modern church began). 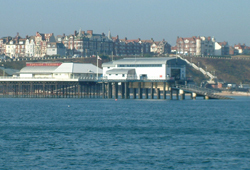 In 1565 Cromer is listed as a landing place with a pier, with 117 householders. The merchants traded far afield, and Cromer vessels crossed the North Sea, sailed to the Baltic and even to Iceland and Greenland. The coming of the railways and the accompanying publicity started by the travel writer and theatre critic Clement Scott - who coined the name Poppyland for the area - led to a further rush of visitors in the final decade of the 19th century. 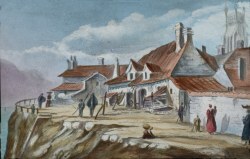 Many of those visiting the town contributed to local prosperity and building substantial houses. Others took the opportunity to develop businesses based on the holiday trade. The great hotels, few of which remain, date from this time. With the decline of the town after the medieval period, the church itself had fallen into a considerable state of disrepair. The Reformation and the time of Oliver Cromwell's Commonwealth had also contributed to the deterioration of many church buildings. 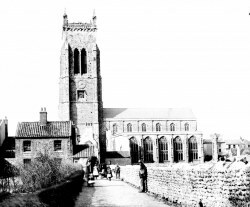 The church windows had largely been bricked up and the chancel had been demolished. Reverend Thomas Gill had resorted to the use of gunpowder for this purpose in 1681. The restoration of the church was undertaken in the reign of Queen Victoria, and it was substantially restored for the beginning of the 20th century. Today Cromer and district remain a very popular spot for visitors. Of course it is not possible to guarantee the sunshine and warmth of overseas destinations, but the summer can offer open beaches, country walks, safe sea bathing and a variety of interesting places to visit. The area now offers a selection of activities, from the local museums, the swimming pool at Sheringham, heritage railway journeys, 'Seaside Special' at the end of the pier - plenty to interest everyone except perhaps those who want to be absolutely certain that they can lie on the beach all day and dance all the night away!